Fusion technology has long held the promise of producing safe, abundant, carbon-free electricity but a pivotal challenge exists: Researchers must create and harness fusion reactions to produce net energy gain. In order to fast track an innovative solution, MIT announced plans last March to work with a new private company, Commonwealth Fusion Systems (CFS), to carry out rapid, staged research leading to a new generation of fusion experiments and power plants based on advances in high-temperature superconductors. The Italian energy company Eni, a founding member of the MIT Energy Initiative, invested $50 million in CFS, which is funding fusion research at MIT as part of a joint collaboration focused on rapidly commercializing fusion energy and establishing a new industry. Meanwhile Eni has also funded additional fusion research projects run out of PSFC’s newly created Laboratory for Innovation in Fusion Technologies (LIFT). This is where Sorensen and colleagues are helping to perfect the design and economics of compact fusion power plants. “There is the plasma physics and magnet technology side of things — but there are also engineering challenges where people like me can play an important role in making fusion plants significantly better in design. I see many exciting opportunities for collaboration,” she says. 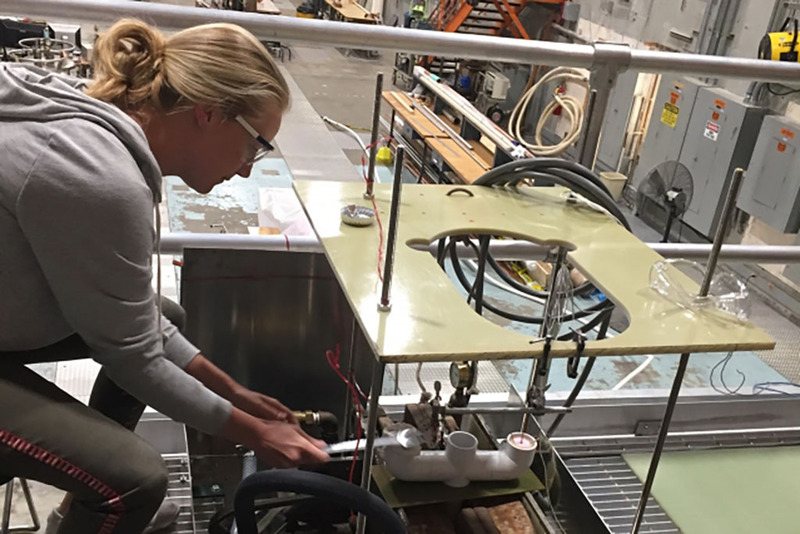 Sorensen is studying a key element of the fusion pilot plant: the liquid immersion blanket, essentially a flowing pool of molten salt that completely surrounds the fusion energy core. The purpose of this blanket is threefold: to convert the kinetic energy of fusion neutrons to heat for eventual electricity production; to produce tritium — a main component of the fusion fuel; and to prevent the neutrons from reaching other parts of the machine and causing material damage. “I’m working on the blanket because for me that’s where the rubber meets the road,” says Sorensen. “We need to figure out this kind of technology in order to make fusion plants functional and economical.” Researchers must be able to predict how the molten salt in such an immersion blanket would move when subjected to high magnetic fields such as those found within a fusion plant, she says. Whyte described a growing fusion ecosystem in which researchers across disciplines — mechanical engineering, electrical engineering, aero-astro — are working together to achieve a mutual goal of fusion energy in time to make a difference. “This is exactly the kind of innovative research and development that we should be doing,” he says. Advances in high-temperature superconducting magnets that can access higher fields and smaller machines have enabled rapid cycles of learning and development — an approach embodied in the SPARC concept, which was developed at the PSFC and forms the foundation of CFS’s aggressive effort to demonstrate energy-gain fusion by the mid-2020s and produce practical power plant designs by the early 2030s. In a series of lightning talks seven experts will discuss the current “MIT Fusion Landscape” on Jan. 22 between 1 pm and 3 pm at 50 Vassar Street (MIT 34-101). Topics will range from engineering and scientific underpinnings to finance, entrepreneurship and social impact. People are welcome to attend to learn about MIT’s smarter, sooner path to fusion energy.